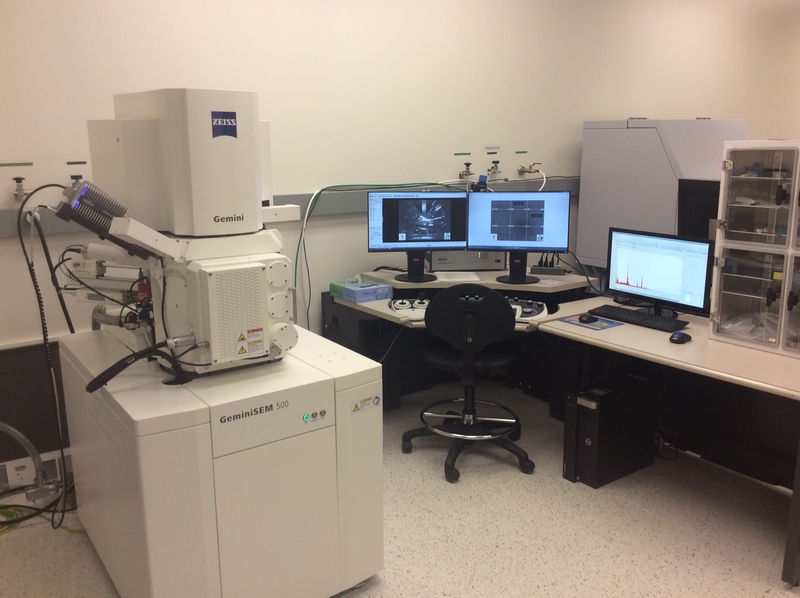 Zeiss GeminiSEM 500 with Bruker EDS detector. Our dedicated SEM system is a Zeiss Gemini 500 column using a Schottky thermal field emitter filament for imaging between 0.1 and 30 kV for sub-nanometer resolution imaging. Images can be taken with an inlens detector, secondary electron detector, a backscatter electron detector or combinations thereof, all to achieve optimal imaging of a wide array of samples with high contrast and minimal sample damage. The system can also vary the pressure within the sample chamber to mitigate for charging of non-conductive samples and is equipped with an EDS for spot identification of the composite materials of a sample.